If a portfolio holds options, it is exposed to changes in implied volatilities. These can be modeled with key factors just like any other risk factors, but an inference procedure will require historical implied volatility data. Implied volatilities are rarely quoted directly in the market. An exception is the OTC currency options market, but in most markets, implied volatilities must be inferred from option prices. A challenge in compiling historical data for implied volatilities is the sheer volume of data. For a single underlier, options may trade for multiple maturities and multiple strikes. Also, different implied volatilities may apply to different options structures. Put-call parity ensures close compatibility between put and call implied volatilities for a given underlier, but this is not true of other structures. Interest-rate caps and interest-rate swaptions ostensibly have the same underliers, but they are different instruments. Implied volatilities for one are remotely related to those of the other. To provide a sense of the volume of raw data involved, consider put and call options traded on the Coffee, Sugar and Cocoa Exchange6 (CSCE). On April 26, 2001, the exchange listed settlement prices for 536 distinct options on coffee futures, 247 options on sugar futures, and 328 options on cocoa futures. This is data generated in a single day for just three underliers! Faced with such an avalanche of data, we must find some means of organizing and synthesizing it into a form that is amenable to time-series analysis. Implied volatilities vary by expiration. 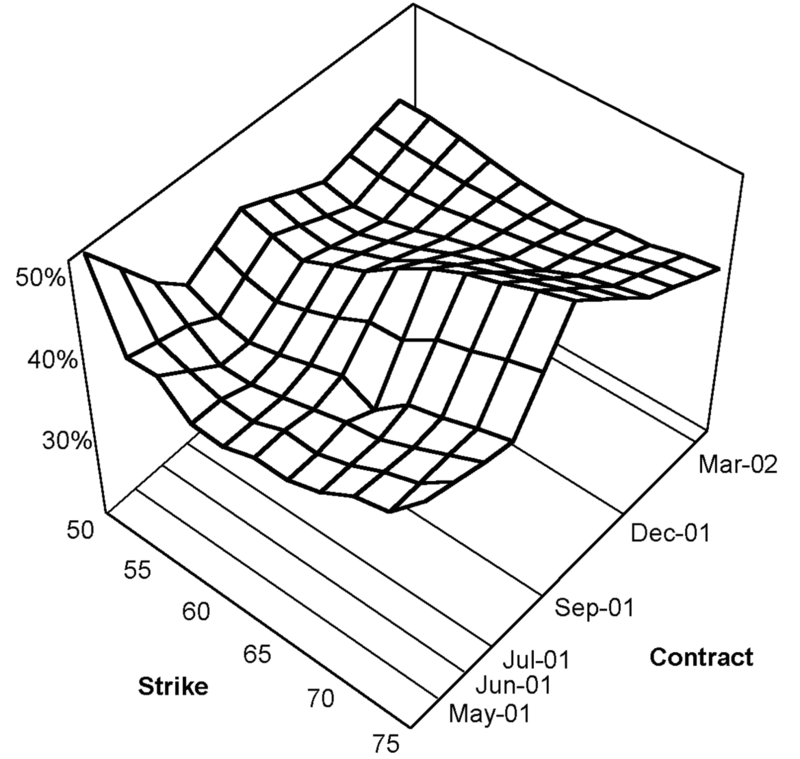 In most markets, they also vary by strike—a phenomenon that is referred to as skew. If data is to reflect both expiration and strike dependencies, it must comprise an entire volatility surface for each trading day. Such a surface is illustrated for options on coffee futures in Exhibit 6.12. A volatility surface is generally recorded as a set of implied volatilities for specific expiration-strike pairs. Below, we discuss how to choose those pairs for tracking historical implied volatility data. Exhibit 6.12: The implied volatility surface for CSCE coffee call options on March 12, 2001. Skew is apparent, as is a spike in volatilities for the September contract. If options are OTC, implied volatilities are generally tracked for constant-maturity expirations. For exchange-traded options, we may track implied volatilities either for constant-maturity expirations or as nearbys. Although there are exceptions, most exchange-traded options are either on equities or futures. For exchange-traded equity options, as long as there are sufficient expirations to facilitate interpolation, it makes sense to track constant-maturity implied volatilities. This will avoid the nonstationarities and artifact returns associated with nearbys. Since equity markets exhibit no pronounced seasonalities, constant-maturity implied volatilities are generally well behaved. For exchange-traded options on futures, it is usually best to treat options in the same manner as you do the underlying futures. If you track the futures as nearbys, track the implied volatilities as nearbys. Options on futures may expire as much as a month prior to the underlying future. Accordingly, rollover dates for implied volatility nearbys are likely to precede rollover dates for the futures. As long as a mapping procedure recognizes when an implied volatility from one nearby corresponds to the futures price of the subsequent nearby, this should present no problem. Another challenge is that there may be more options expirations than futures expirations. The CSCE has futures expiring on only certain months, but options on those futures expire monthly. Such issues can be addressed on a case-by-case basis through suitable construction of both nearbys and the mapping procedure. Many of the distortions that arise with futures nearbys also arise with volatility nearbys. Analogous solutions generally apply. We need the strikes to bracket the current underlier price. Strikes that do so today may fail to do so in the future. Because of skew, observed implied volatilities for a given strike will rise and fall as that strike moves in and out of the money. A standard solution is to track implied volatilities for strikes corresponding to specific normalized7 deltas. For call options, we might track implied volatilities for deltas of .25, .50, and .75. Over time, the corresponding strike prices will change, but the deltas will remain constant. We obtain time series for out-of-the-money, at-the-money, and in-the-money implied volatilities. Note that the .75 delta will correspond to a lower strike price than the .25 delta. Also, by put-call parity, call-option implied volatilities for deltas of .25, .50, and .75 should correspond to put implied volatilities for deltas of –.75, –.50, and –.25, respectively. In most markets, it is necessary to track implied volatilities for only calls or only puts, as put-call parity will ensure close correspondence between the respective volatilities. Violations of put-call parity may occur for far in-the-money or far out-of-the money options. For options with significant time value, such violations may become apparent at call deltas of .25 and .75. A solution is to track implied volatilities for a more narrow range of deltas, say .35, .50, and .65. Corresponding put deltas would be –.65, –.50, and –.35, respectively.